The Battle of Palo Alto (Spanish: Batalla de Palo Alto) was the first major battle of the Mexican–American War and was fought on May 8, 1846, on disputed ground five miles (8 km) from the modern-day city of Brownsville, Texas. A force of some 3,700 Mexican troops – most of the Army of The North – led by General Mariano Arista engaged a force of approximately 2,300 United States troops – the Army of Occupation led by General Zachary Taylor. On April 30, following the Thornton Affair, Mexican General Mariano Arista's troops began to cross the Rio Grande. On May 3, the troops began to besiege the American outpost at Fort Texas. Taylor marched his Army of Occupation south to relieve the siege. Arista, upon learning of his approach, diverted many of his units away from the siege to meet Taylor's force. The battle took place on May 8, three days before the formal declaration of war on Mexico by the United States. Arista ordered two cavalry charges, first against the American right flank and later against the left. Both were unsuccessful. The American victory is widely attributed to superior artillery, while the U.S. "light" artillery was much more mobile and accurate than that of the Mexican forces. That evening, Arista was forced to withdraw further south. The armies clashed again the next day at the Battle of Resaca de la Palma. On April 30, following the Thornton Affair, Arista started crossing the Rio Grande at Longoreno with his main army, first with General Pedro de Ampudia's 1st Brigade and four guns. Taylor prepared Fort Texas to withstand a siege while he moved most of his forces to protect his supply base at Fort Polk near Point Isabel, 23 miles northeast of present day Brownsville, Texas, and having a Gulf of Mexico pass suitable for ships. Fort Texas was garrisoned by Taylor with 500 men under Major Jacob Brown, including the 7th Infantry, Capt. Allen Lowd's four 18-pounders, and Lt. Braxton Bragg's field battery. The battle began as a result of Mexican efforts to besiege Fort Texas on May 3, General Zachary Taylor, in command of the Army of Occupation, receiving supplies from Fort Polk on Point Isabel, heard the distant report of cannon fire. 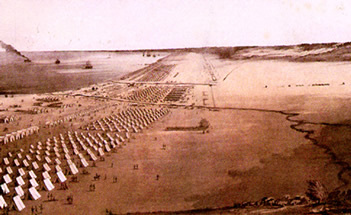 Taylor started his return to Fort Texas on May 7 with 2,228 men plus his 200-wagon supply train. General Arista immediately left his camp at the Tanques del Ramireno with his army, with the intention of blocking Taylor. Ampudia's brigade left the Fort Texas siege to join him. Taylor's scouts sighted the Mexican force at noon on the 8th. Facing north and moving left to right, General Arista's army consisted of General Antonio Canales Rosillo's 400 irregular cavalry in chaparral, Anastasio Torrejon's cavalry brigade consisting of the 8th, 7th and Light Cavalry, astride the Point Isabel road, then came General Jose Maria Garcia's brigade of the 4th and 10th Infantry with two 8-pounders, then General Rómulo Díaz de la Vega's brigade of the 10th and 6th Infantry with five 4-pounders, then the Tampico Corps, the 2d Light Infantry and a sapper battalion with a 4-pounder. Behind this line was Col. Cayetano Montero's light cavalry. Facing south and moving right to left, Taylor, with a force of 2,300 men and 400 wagons, placed Col. David E. Twiggs with Lt. Col. James S. McIntosh's 5th Infantry and Maj. Samuel Ringgold's artillery battery, followed by Capt. Lewis N. Morris' 3d Infantry with Lt. William H. Churchill's two 18-pounders astride the road, followed by Capt. George W. Allen's 4th Infantry, Lt. Thomas Childs' artillery battalion, Lt. Col. William G. Belknap's wing, James Duncan's battery, then Capt. William R. Montgomery's 8th Infantry on the American left. Lt. Col. Charles A. May's dragoon squadron guarded the left flank and Capt. Croghan Ker guarded the train. Montgomery was slightly wounded during the battle, along with approximately ten other officers, some of them severely. Taylor halted his columns and formed a line behind his batteries when the Mexican artillery started firing at 2 PM. The American artillery was very effective while the Mexican artillery often fell short. Arista ordered Torrejon's cavalry to attack the American right, but progress was slow, allowing Twiggs to form the 5th Infantry into a square to meet them with a couple of volleys. A fire started from a cannon burning wad which halted fighting for an hour as the smoke paralleled between the lines of the opposing forces. Arista pulled back 1,000 yards on his left and Taylor advanced accordingly, rotating the axis of the battle 40 degrees counterclockwise. May failed to turn the Mexican left before the artillery duel resumed. Child's artillery battalion formed a square to repel another Torrejon cavalry charge. Duncan's battery stopped Arista from turning the American left and then advanced with the 8th Infantry and Ker's dragoons to drive the Mexican right from the field. A charge ordered by Arista at this time resulted in the light cavalry fleeing along the Mexican line, taking the 6th Infantry with them. Fighting stopped with dusk and both armies camped for the night. The morning of the 9th revealed the Mexican army slowly moving south. Taylor sent forward a 220-man battalion under McCall to reconnoiter the Mexican positions. The Battle of Resaca de la Palma would follow. Major Ringgold was struck by a cannon ball and mortally wounded during the battle but Ringgold's and Duncan's effective cannoneers with their "Flying Artillery"—the tactic of using light artillery to attack then quickly move to another location and fire once more, carried the day and won the battle for the Americans. General Zachary Taylor emerged from the war a national hero. The battlefield is now Palo Alto Battlefield National Historical Park and is maintained by the National Park Service. 7th & 8th Line – Col. A. Torrejon? Artillery battery (4x 4-lb) – Capt. Ballarta? Zachary Taylor established Fort Polk[b], near Point Isabel, 23 miles northeast of present day Brownsville, with a Gulf of Mexico pass suitable for ships' landings, on March 24, 1846 as a supply base for his operations leading up to the Battle of Palo Alto, and used it until 1850. He garrisoned it with two artillery companies under Major John Munroe. Major Charles Thomas was the Depot Quartermaster using wagons and river steamers to supply Taylor. Taylor established camps for those heeding his call for volunteers at Point Isabel, the north end of Brazos Island, and along the Rio Grande between Barita and Fort Brown, at a place known as Camp Belknap. Taylor's three brigades camped at Corpus Christi along the Nueces River in 1845 before the march south to the Rio Grande. ^ Painting is in error by depicting background mountains. The nearest in any direction are 240 miles away, near Monterrey, NL, MX. Bauer, Karl Jack (1974). The Mexican War, 1846-1848. New York, Macmillan. ISBN 978-0-8032-6107-5. "Palo Alto Battlefield". National Park Service. 2017. Retrieved June 25, 2017. "Battle of Palo Alto". A&E Television Networks: History.com. 2017. Retrieved June 25, 2017. Chartrand, René. "Santa Anna's Mexican Army, 1821–1848"
Crawford, Mark. "Encyclopedia of the Mexican-American War"
Haecker, Charles M. (1997). On the Prairie of Palo Alto. Texas A&M University Press. ISBN 9780890967584. Brooks, Nathan C. A Complete History of The Mexican War. Applewood Books (664 pages). ISBN 9781429021005. Robarts, William Hugh (1887). Mexican War Veterans: A Complete Roster of the Regular and Volunteer Troops in the War Between the United States and Mexico, from 1846 to 1848. Brentano's.